Brigitte Chataignier’s evocative and atmospheric film, La Danse de l’Enchanteresse – co-produced with Adoor Gopalakrishnan, Kerala’s famed film director – is a visual ode to the classical dance from Kerala, Mohiniattam (which literally means ‘dance of the enchantress’). The absence of dialogue provides a hint of mystery and the brilliant imagery and exquisite music speak much louder than words. Throughout the 75-minute film, we see different aspects of Mohiniattam revealed through a collection of scenes shot in scenic locations around Kerala. A peek through a doorway reveals a class in progress in a temple courtyard, dancers in resplendent white Kerala saris practice adavus under the watchful eye of their guru, seated in a circle with their teacher dance students learn a padam, dancers in costume apply eye makeup, there is a rehearsal with musicians, a recital in a temple. Interspersed with these dance images, we are also offered glimpses of life in Kerala: a young girl looking out over a lake lost in thought, a bus journey, a village temple, pouring rain. Several prominent Mohiniattam gurus and dancers are featured in the film. For Brigitte Chataignier, the film is a testimony of a certain time which she wanted to capture and preserve. It is also a homage to her dance gurus and to Maharaja Swati Tirunal, the 19th century poet, composer and musician. His compositions are featured in the film and some scenes were shot in his palaces. I had the chance to see La Danse de l’Enchanteresse in Bangalore during the 2009 Attakkalari India Biennial and spoke to Brigitte Chataignier about her film. I had the idea to make this film for a long time. In the process, I interviewed teachers and older people and asked them not only about Mohiniattam, but also about the arts and life in Kerala. I’m a big admirer of the work of Adoor Gopalakrishnan and I quickly realized that he was the only person who I could collaborate with on this project. What I appreciate about his work is his fabulous use of light. I approached him and told him about my idea. He didn’t agree at first. But slowly through the many discussions we had, an understanding and friendship developed between us and after some time he agreed to do the film. We both agreed that we wanted to create a certain atmosphere in this film. We wanted to bring out the essence of Mohiniattam while also capturing a certain time period in India, a time which is quickly disappearing. We carefully thought out and planned each scene in detail and wrote the scenario together. We decided to have very little dialogue and an underlining ‘hint’ of a story. We didn’t want to tell too much. Throughout the film different aspects of Mohiniattam are revealed. There are glimpses of each item of the Mohiniattam repertoire. And interspersed with these are short ‘vignettes’ or glimpses of life in Kerala. Who are the gurus and dancers featured in the film? The teachers are Satiabhama, Sreedevi Rajan, Kalamandalam Kshemavathy and Kalamandalam Leelamma. I wanted to bring them all together in the film. I found that each had certain qualities and thought they could all be featured, like all the fingers in a hand. There are four main styles of Mohiniattam. Three are represented here. There are also glimpses into the relationship between teacher and student. Some of the dancers include Kalaratna Smitha Rajan, Dr Neena Prasad, and Pallavi Krishnan. Tell me more about the underlying theme or story in the film. The story is of a young dance student who is living a romance ‘in her head’: she’s thinking of the potential husband she’ll meet one day. She is a young girl with love on her mind. The theme is sringara, longing, separation. The same themes we find in padams. So there is a link between the poetry and lyrics of the padams featured in the film and the girl’s story. Very well. It received good reviews. The film is beautiful to watch, it’s also very contemplative, so it’s appreciated by art lovers and connoisseurs, and those who like India, dance, meditation, yoga. It is not at all a commercial film so it was shown only at select cinemas which feature films on art and dance. It was also screened at several film festivals in Europe, Asia and in Brazil and won a prize in 2008 at the International Audiovisual Festival of Performing Arts in Lisbon, Portugal. In India it has been shown in Trivandrum, the Habitat Centre in Delhi, Shantineketan, Calcutta and now Bangalore. The locations used in the film are stunning. Where are they located? Yes a lot of thought had gone into selecting locations. We see Maharaja Swati Tirunal’s palaces in Trivandrum and Padmanabhapuram, a small Shiva temple in a local village, the Kuthambalam theatre at the famous Kalamandalam school and Thiruvattar temple. We also see traditional Kerala houses with their courtyards and verandas. These locations provide an echo of history. Time stops in the film. It captures a certain time, a memory of a certain time. It’s a testimony of something I felt and a homage to my teachers. The aim was not to illustrate the complete technique and every detail of the dance but rather the feeling of lasya in Mohiniattam and the atmosphere of Kerala, which I really love. This is what I wanted to preserve in this film. Thanks, Isabel, for sharing this! It looks like a lovely film, and the video clips are wonderful. Do you think it will eventually be released on dvd? Hi Liz, thanks for stopping by. It's available in DVD format on amazon.fr! Many thanks for visiting and for leaving your comment. I don't believe it was the directors' intention to create a documentary on the history of Mohiniattam. I think you're correct in saying that it's a docu-fiction. The film reveals different aspects of the dance and a slice of life during another time. If Mohiniattam was not originally danced in the temples, why can it not be performed in temples today? Isn't it after all an offering to god? Mohiniattam was probably not originally performed in metropolitan theatres or international festivals either. 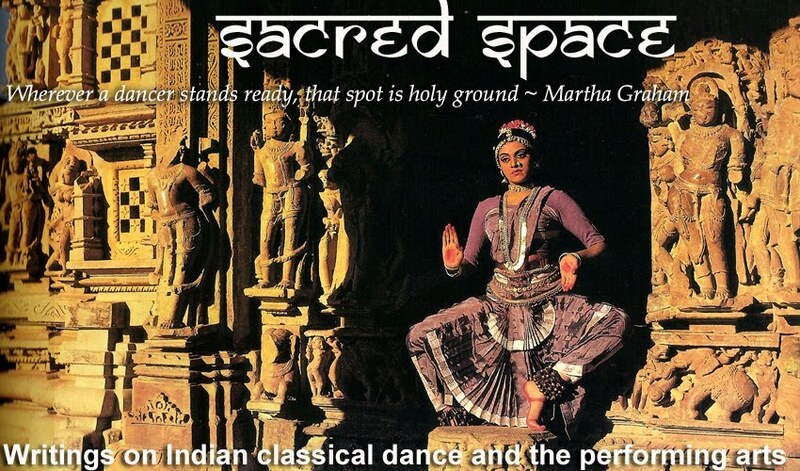 But all of India's dance forms have evolved with time, like with everything in life and society. I have forwarded your comment to Brigitte so that she may reply. Thanks again for contributing to the discussion.